← Polk County, Florida. April 6th, 2011. Bartow, Florida. April 6th, 2011. The sinkhole opened Friday morning in a fenced water retention area in the Summerlin Oaks apartment complex at 980 E. Church St. Some residents were curious about it and interested in the efforts to fill it, but said they didn’t see it as much of a threat. One resident said she didn’t know about the sinkhole, and another said she was worried about the potential for other problems because she’s seen small cracks in her walls around the windows. Phillip Madrid, a civil engineer and sinkhole specialist with Madrid Engineering in Bartow, said heavy amounts of water flowing through an area designed for stormwater retention can lead to a sinkhole. “If there’s a void in the limestone, and water is flushing through the sandy soil above that, the sand and water can wash into that void,” he said. The sinkhole measures 25 feet wide and stretches about 30 feet deep, in the gully of a long, narrow stormwater retention area along the western boundary of the apartment complex. Summerlin Oaks has a trash compactor and a storage building near the sinkhole site, but none of the apartment buildings appears to be in danger. Crews with Certified Foundations Inc. in Lakeland, which has been hired to remediate the sinkhole, began filling in the hole Monday. Officials said the process must be approved by the Southwest Florida Water Management District because the sinkhole lies in a watershed area, according to a news release. 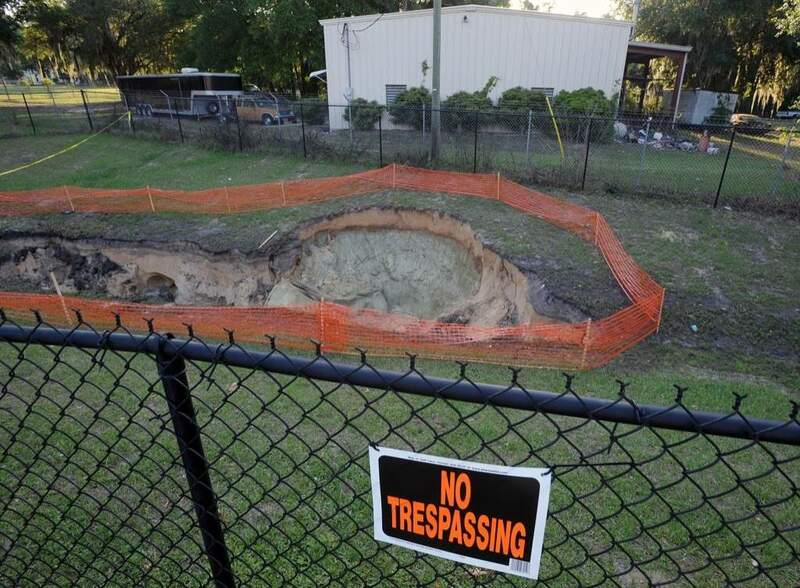 This entry was posted in Pictures and tagged Bartow, Florida, sinkhole. Bookmark the permalink.